Like every other Nigerian marriages; the Jukun traditional marriage is meant to promote African culture and its beauty. Traditional marriage requirements and bride price list of the jukun people is fill with glamour and richly embedded in our culture. Jukun are the direct descendant of the people of ancient Kwararafa Kingdom. Before the coming of Christianity and Islam, the Jukun’s are predominantly traditional worshipers. Marring a Jukun lady or girl is presume/perceived to be the cheapest in Taraba state and northwestern Cameroon. 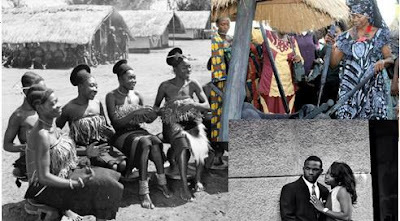 This has made many Jukun men come back home to pick a wife in order to retain the rich cultural heritage of the Jukun people. However, that does not mean an inter-religious or cross-cultural marriage is not encouraged. The Jukun are polygamous, aside those who practice Christianity. The Jukun detest divorce and goes out of their way to see that their marriages work. When all efforts and negotiation fails divorce may take place, and if the following happens - impotence/bareness, insanity of spouse, adultery/leaving spouse for 12 months for no genuine reasons. The minimum age of marriage for a jukun girl is 18 years. The Jukun traditional marriage is only biding when the father or guardian of the girl gave their consent. The marriage contract can only take place when bride price is presented and payment of customary gift to father or guardian of the bride. Therefore, marriage is only recognized in Jukun tradition when the intending husband fulfils all necessary marriage rites and requirement. During courtship the man is expected to give the woman certain amount of money as her entitlement or as betrothed money called Abegya – N 200. 5. Abewagaben (Solemnization money) – N100 , this can only take place when requirement (i – iv) has been meet. 12. 18 sticks for the fencing of father in-law’s compound. 21. 3 basins of Kununzaki (Local guinea corn juice).